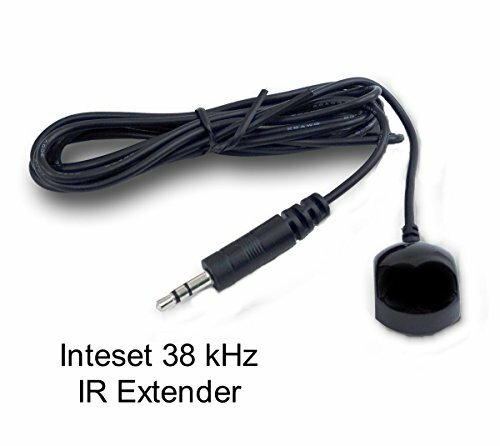 This 38 kHz IR Receiver is sold exclusively by Inteset. No other Vendors sell or ship the same extender. It has been built with the highest quality materials available.There is no better receiver from any competitor at any price. This allows you to hide your cable set top box behind closed doors in a cabinet or closet. The small receiver bud (7/8" x 15/16") will handle all of the same functions as if your set top box was out in the open. It is made to work with nearly all 38 kHz Set Top Boxes (STB) that have a 3.5 mini IR jack in the back of the device. It comes with self stick tape on the back of the IR bud for easy installation on any flat surface. Be sure to mount the bud with a straight line-of-sight to your remote. Below are some of the devices that are confirmed to work with this receiver. Please check your device to be sure you have a 3.5 mini input jack labeled "IR IN". 6 ft shielded cable, 3.5 mini plated stereo plug. Tip-VCC 5V, Center-Data, Lower-Ground. Works with all Universal Remotes and many cable boxes with an IR IN jack. See the exceptions listed below. Infrared Resources 9ft 38-56kHz External Universal IR Receiver Extender for Verizon FiOS + most Cable Boxes and DTA units.